Low and high clouds in western Scotland, looking south from Ben Challum (1025 m asl.) February 15, 2008. The linear high cloud are contrails from airplanes passing over UK. A cloud is a visible mass of condensed droplets or frozen crystals floating in the atmosphere above the surface of the Earth or another planetary body. On Earth the condensing substance is typically water vapour (see diagram below), which forms small droplets or ice crystals, typically 0.01 mm in diameter. When surrounded by billions of other droplets or crystals they become visible as clouds. Clouds form when the dewpoint of water is reached in the presence of condensation nuclei in the troposphere, the lowermost 10-15 km of the atmosphere. Dense deep clouds exhibit a high reflectance (70% to 95%) throughout the visible range of wavelengths: they thus appear white when seen from above. Cloud droplets tend to scatter light efficiently, so that the intensity of the solar radiation decreases with depth into the cloud. Depending on their thickness and the density of water droplets, clouds may therefore appear grey or dark when seen from below. Cloud condensation nuclei or CCNs are small solid or liquid particles (typically 0.0002 mm) about which cloud droplets coalesce. Water requires a non-gaseous surface to make the transition from a vapour to a liquid. When no CCNs are present, water vapour can be supercooled below 0°C (32 °F) before droplets spontaneously form (this is the basis of the cloud chamber for detecting subatomic particles). There are many different types of atmospheric particulates that can act as CCN. The particles may be composed of dust or clay, soot or black carbon from grassland or forest fires, sea salt from ocean wave spray, soot from fires, sulphate from volcanic activity, phytoplankton, or by nuclei formed by cosmic radiation. The ability of these different types of particles to form cloud droplets varies according to their size and also their exact composition. Click here to jump back to the list of content. Evaporation from the Barents Sea north of Norway produces linear cloud systems drifting south, March 30, 2003. The clouds are seen to originate shortly south of the sea ice limit in the upper part of the picture, where the cold and dry Arctic air masses for the first time come into contact with the warm sea water. The island Jan Mayen is seen near the southern tip of the tongue of sea ice in the upper central part of the picture. Northern Norway, Finland and part of Russia is seen snow covered in the lower right part of the picture, which covers a distance of about 1000 km from south to north. Clouds represent an important factor in the recycling of the important greenhouse gas water vapour from the planet surface to the atmosphere and back again to the surface. Evaporation of water removes heat from the planet surface, and represent an important cooling process. Higher up, part of the lifted water vapour will condensate to form small water droplets and clouds, whereby latent heat is released, causing warming and additional convection and cloud formation. Space shuttle view of cloud systems forming by convection of air masses over the Pacific Ocean. Evaporation consumes heat and leads to surface cooling. Higher up condensation of the water vapour releases heat, which leads to warming of the atmosphere. By convection both heat and water vapour is removed from the surface and are transported up into the atmosphere. The picture covers an horizontal distance of about 40 km from left to right. The heat that is released by condensation of water vapour and cloud formation is deposited in the middle and upper troposphere. From here the heat is able to radiate into space, thereby ensuring that the planet as such will not overheat. Some of the condensated water vapour will fall as precipitation, transporting water back to the planet surface and removing water vapour from the atmosphere. On average, all of the water evaporated from the surface must at some point condensate and fall back to the surface as precipitation. After it reaches the surface, the water is once again available to remove more heat through evaporation, starting the cycle all over again. Much precipitation falls in connection with big weather systems such as cyclones, which contribute to reduce the amount of water vapour in the atmosphere. As water vapour is the single most important greenhouse gas, both evaporation and precipitating weather systems therefore are important for the total planetary greenhouse effect. Precipitation falling from clouds southwest of Oslo, August 28, 2007. By precipitation the greenhouse gas water vapour is removed from the atmosphere and recycled back to the planet surface. 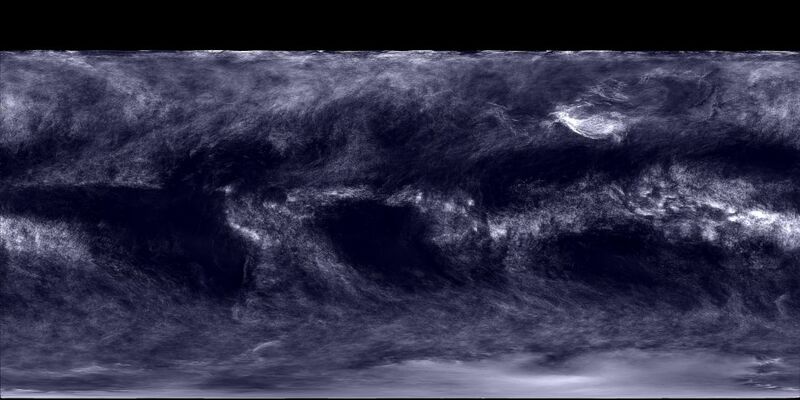 During the period of observations, the total amount of water vapour in the atmosphere varied around ca. 2.5 cm (see diagram above). Peaks of ca. 2.6 cm were reached around 1985 and 1995-1997, and a low was experienced in 1991, terminated almost simultaneously with the beginning of the huge Mount Pinatubo volcanic eruption in 1991. Beginning in 1998, a step-like decrease began, ending in 1999. Since then the atmospheric total content of water vapour has remained relatively low, at about 2.3 cm in total. As cloud formation not only is dependant on the amount of water vapour, but also depends on the concentration of cloud condensation nuclei (CCNs), this long-time development is not clearly reflected in the global cloud cover. Among the different cloud types, the highest long-term association between water vapour content and cloud cover is apparently seen in relation to low clouds, while other cloud types show little association. On a shorter time scale, however, the annual variation of water vapour and global cloud cover occur in concert with each other. Variations in the total column water vapour in the atmosphere since July 1983. The upper graph (blue) shows the total amount of water in the atmosphere. The green graph shows the amount of water in the lower troposphere between 1000 and 680 mb, corresponding to altitudes up to about 3 km. The lower red graph shows the amount of water between 680 and 310 mb, corresponding to altitudes from about 3 to 6 km above sea level. The marked annual variation presumably reflects the asymmetrical distribution of land and ocean on planet Earth, with most land areas located in the northern hemisphere. The annual peak in atmospheric water vapour content occur usually around August-September, when northern hemisphere vegetation is at maximum transpiration. The annual moisture peak occurs simultaneously at different levels in the atmosphere, which suggests an efficient transport of water vapour from the planet surface up into the troposphere. The time labels indicate day/month/year. Data source: The International Satellite Cloud Climatology Project (ISCCP). There is a possibility that the step-like change shown 1998-1999 to some degree may be related to changes in the analysis procedure used for producing the data set, according to information from ISCCP. Last data: December 2009. Last figure update: 4 September 2011. Water vapour is the single most important greenhouse gas, wherefore it is interesting to note that global warming since 1978 apparently terminated in 1998, simultaneously with the step-like decrease in atmospheric water vapour content. Global climate models forecast an increasing amount of atmospheric water vapour along with global temperature increase. Relative atmospheric humidity (%) at three different altitudes in the lower part of the atmosphere (the Troposphere) since January 1948 (Kalnay et al. 1996). The thin blue lines shows monthly values, while the thick blue lines show the running 37 month average (about 3 years). Data source: Earth System Research Laboratory (NOAA). Pre-1973 data from the United States is not homogeneous according to Elliot and Gaffen (1991). See also data description by Kalnay et al. (1996). Last month shown: March 2019. Last diagram update: 10 April 2019. Click here to download the raw data used to generate the above diagram. Use the following search parameters: Relative humidity, 90N-90S, 0-357.5E, monthly values, area weighted grid. Specific atmospheric humidity (g/kg) at three different altitudes in the lower part of the atmosphere (the Troposphere) since January 1948 (Kalnay et al. 1996). The thin blue lines shows monthly values, while the thick blue lines show the running 37 month average (about 3 years). Data source: Earth System Research Laboratory (NOAA). Pre-1973 data from the United States is not homogeneous according to Elliot and Gaffen (1991). See also data description by Kalnay et al. (1996). Last month shown: March 2019. Last diagram update: 10 April 2019. Click here to download the raw data used to generate the above diagram. Use the following search parameters: Specific humidity, 90N-90S, 0-357.5E, monthly values, area weighted grid. Click here to see association between sunspot number, sea surface temperature, and atmospheric specific humidity at 300 mb. Most climate models assume that as an increasing amount of atmospheric CO2 induces slightly increasing atmospheric temperatures, the overall evaporation will increase from the planet surface, and thereby the specific humidity of the lower part of the atmosphere (the Troposphere) will increase as well. As water vapour is the most important greenhouse gas, additional warming will come about, resulting in a much larger temperature increase than that induced from CO2 alone. Climate models therefore, in general, assume the relative Tropospheric humidity to remain more or less stable, as increasing air temperatures are compensated by increasing specific humidity. The above diagrams indicate that none of this has been the case since 1948. Only near the planet surface, the relative humidity has remained roughly constant (although with variations), but in the remaining part of the Troposphere below the Tropopause the relative humidity has been decreasing. Even for the specific humidity, this appears to be the case. It has, however, recently been suggested that it that the negative long-term specific humidity trends shown by the above data series are doubtful, and that instead the trend is towards increasing specific humidity (see, e.g., Dessler and Davis 2010). Total amount of precipitable water in the atmosphere above the oceans 7 April 2019 (mm water equivalent), at 14 hr (UTM-time). White areas are areas without data. Map source: NOAA. Please use this link if you want to see the original diagram (NOAA 18) or want to check for a more recent update than shown above. Cloud albedo is a measure of the reflectivity of a cloud. High values mean that the cloud can reflect more solar radiation. Cloud albedo varies from less than 10% to more than 90% and depends on drop sizes, liquid water or ice content, thickness of the cloud, and the sun's zenith angle. The smaller the drops and the greater the liquid water content, the greater the cloud albedo, all other factors the same. Cloud fraction January 2008. 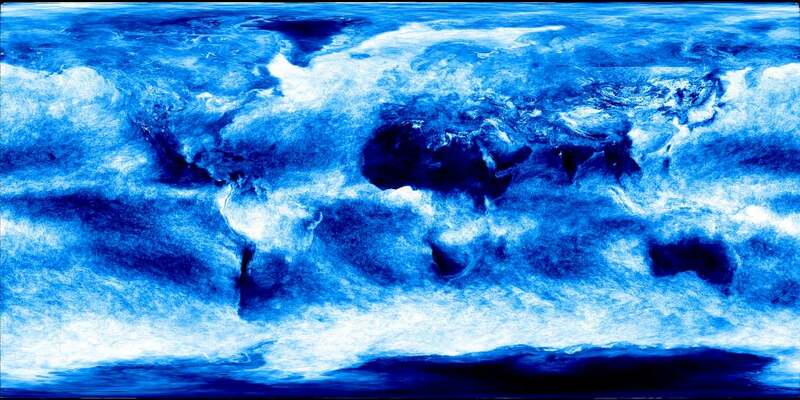 The cloud fraction expresses how much of the Earth is covered by clouds. Cloud fraction is measured from space using satellite sensors like the MODIS (Moderate Resolution Imaging Spectroradiometer) aboard NASA's Terra and Aqua satellites. MODIS collects information in gridded boxes measuring one square kilometre. Cloud fraction is the portion of each pixel that is covered by clouds. The cloud cover plays an important role in regulating the amount of energy that reaches the Earth from the Sun as well as the amount of energy that the Earth reflects and emits back into space. Most clouds reflect sunlight very well. Globally, they reflect about 20 percent of the energy coming from the Sun back into space. At the same time, clouds trap the heat that radiates from the Earth's surface, preventing energy from escaping into space. Changes in cloud cover will change the balance in Earth's energy budget so that either more energy escapes into space or more energy reaches the Earth than it does now. Any such change would change air temperatures and weather patterns. Imagery by Reto Stockli, NASA's Earth Observatory, using data provided by the MODIS Atmosphere Science Team, NASA Goddard Space Flight Center. Clouds are generally produced by atmospheric motions with an upward component that cool the air; in some cases, particularly in the upper atmosphere and polar regions, radiative cooling can also cause clouds to form. Clouds may form when the air mass is cooled below its dew point. This may happen when the air rises or comes into contact with a cold surface. This can happen where cold and warm air masses collide, and the warmer air (with less density) is lifted to greater altitude. It can also happen where air masses are flowing across a mountain range and are lifted for orographic reasons, or it may be caused by convection due to warming of the terrain surface below. Clouds may form when warm air blows over a colder surface such as a surface of water with low temperature. Clouds can be formed at places where the air temperature increases slowly or remains unchanged, but the air mass rapidly absorbs water vapour from a surface below until it reaches the dew point. This often happens where cold and dry air masses flow across a warm ocean surface without ice cover. The actual form of cloud created depends on local conditions like the strength of the uplift and the air stability. In unstable conditions convection dominates, creating vertically developed clouds. Stable air produces horizontally homogeneous clouds. Frontal uplift along colliding warm and cold creates various cloud forms depending on the composition of the front (warm or cold front). Orographic uplift across mountain ranges also creates variable cloud forms depending on air stability, although cloud types like cap cloud and wave clouds are specific to such orographic clouds. Clouds reflect and shade. Clouds usually have a high reflectivity, depending on water droplet size, cloud thickness and the zenith angle of the sun. Low clouds (stratocumulus) over the Barents Sea, August 18, 2003. Clouds are usually divided into two general categories: layered and convective. These are named stratus clouds (or stratiform, the Latin stratus means "layer") and cumulus clouds (or cumuliform; cumulus means "piled up"). These two cloud types are divided into four more groups that distinguish the cloud's altitude. Clouds are always classified by the cloud base height, not the cloud top. Clouds may also be classified high, middle or low clouds, according to their altitude (the cloud base) above the planet surface. 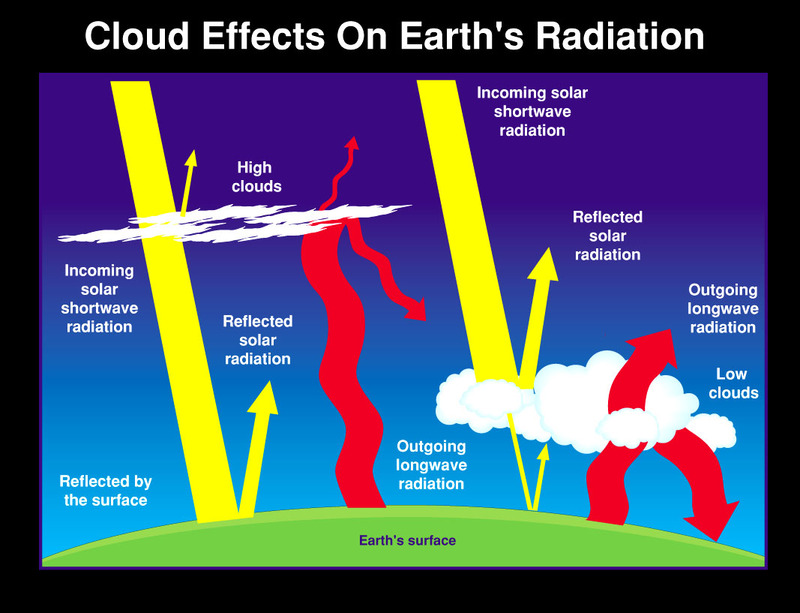 Low clouds primarily reflect incoming solar radiation, whereas high clouds tend to transmit it to the surface but then trap outgoing infrared radiation, contributing to the greenhouse effect. High clouds therefore tend to warm the troposphere, while low clouds tend to have a cooling effect. High clouds (cirrus) over Folldal, central Norway. September 22, 2006. High clouds generally form above 6,000 m, in the cold region of the troposphere. In Polar regions, where tropospheric temperatures generally are lower, they may form as low as 5,000 m. High clouds are denoted by the prefix cirro- or cirrus. At this altitude, water frequently freezes so clouds are composed of ice crystals. The high clouds tend to be wispy and are often more or less transparent. Isolated cirrus clouds often indicate a stable situation and do not bring precipitation, however, large amounts of cirrus clouds can indicate an approaching storm system. Cirrus cloud fraction January 2008. Cirrus clouds are thin clouds high in the atmosphere. They typically form at an altitude of 6,000 meters or higher, where the air temperature is below freezing. Cirrus clouds are composed mostly of tiny ice crystals. They are interesting because they allow most incoming sunlight to pass through them, but they help to contain heat emitted from the surface. Thus, cirrus clouds exert a warming influence on Earth's surface. This map of cirrus was produced using data collected by the MODIS (Moderate Resolution Imaging Spectroradiometer) aboard NASA's Terra and Aqua satellites. The MODIS sensor has a unique band for measuring infrared light at a wavelength of 1.38 micrometers, a wavelength that is highly sensitive to identifying cirrus clouds. Bright white pixels indicate regions completely covered by cirrus clouds. Greyish-white pixels show partial cirrus cover and dark pixels indicate little or no cirrus. Imagery by Reto Stockli, NASA's Earth Observatory, using data provided by the MODIS Atmosphere Science Team, NASA Goddard Space Flight Center. Mid-level clouds (lenticular altocumuli) over Nordmarka, South Norway, June 26, 2005. Middle clouds develop between 2,000 and 5,000 m altitude, and are denoted by the prefix alto-. They are made of water droplets that frequently are supercooled. Many middle clouds form when a large lifted air mass is cooled and the water vapour therefore condensed. Often the lifting will be along a frontal system, and these middle clouds can bring rain or snow. Low clouds (stratocumulus) over Advent Bay, central Spitsbergen, Svalbard. July 31, 2003. Low clouds are found up to 2,000 m altitude and include the stratus (dense and grey). When stratus clouds contact the ground, they are called fog. Several types of low clouds form where cold air masses are displacing warmer air masses (cold front), and may bring localized, heavy rain or snow. A thunderstorm with associated vertical cloud (cumulonimbus) developing over southern Norway near Oslo. August 27, 2007. A fourth cloud type is the vertical cloud, which are caused by strong up-currents, and therefore may rise far above their bases and span across a large altitudinal range. The cloud type cumulonimbus is a well-known type, associated thunderstorms and heavy precipitation, and form during very unstable conditions. They are the tallest clouds, and can reach to the stratosphere. Cumulonimbus clouds are capable of generating locally high winds, hail, lightning, and torrential down pours. The term "nimbo" indicates that these clouds are precipitating. Low clouds tend to have a net cooling effect on global climate. Low level clouds are often thick and reflect much of the incoming shortwave radiation. In addition, because of their low altitude and resulting high temperature they emit large amounts of longwave radiation towards space and higher levels in the atmosphere. Conversely, high clouds tend to have a net warming effect as they because of their high altitude and resulting low temperature only emit little longwave radiation towards space. In addition, they are usually thin, and only reflect little of the incoming shortwave radiation. Scatter diagram showing the total monthly global cloud cover plotted versus the monthly global surface air temperature, since July 1983. High values of global cloud cover is associated with low global temperatures, demonstrating the cooling effect of clouds. A simple linear fit model suggests that an increase in global cloud cover of 1 percent corresponds to a global temperature decrease of about 0.07oC. From a simple statistical point of view, this model explains about 28 percent of observed spread of surface air temperature in the diagram. The global surface air temperature was calculated by adding 15oC to HadCRUT3 temperature anomaly data. Nobody knows the real surface air temperature of planet Earth, but this presumably represents a useful approximation. The statistical association between cloud cover and global temperature shown does not depend upon this calculation. The global cloud data are dominated by the huge surface areas near the Equator, and on a smaller scale the regional and local effect could well deviate from the average global cooling effect displayed by this diagram. The association between low clouds and global temperature is almost similar, as can be seen by clicking here. Data sources: The International Satellite Cloud Climatology Project and University of East Anglia's Climatic Research Unit. Last cloud data used: December 2009. Last figure update: 4 September 2011. It has very sensibly been suggested to me by Mr. Leif-Gunnar Liland that the special conditions during the period following the 1991 Mount Pinatubo eruption might affect the association between monthly cloud cover and global temperature shown in the diagram above. However, removing the data from the period with low temperatures after the eruption (199107-199212) only has a small effect on the statistics as can be seen from the text in the diagram. So the conclusion remains that an increase in total global cloud cover of 1 percent empirically is associated with a global temperature decrease of about 0.06oC. Click here to see a similar analysis for low clouds. Clouds, however, remain one of the largest uncertainties in future projections of climate change by global climate models, owing to the physical complexity of cloud processes and the small scale of individual clouds relative to the size of the model computational grid. The cloud forming processes take place on fractions of a millimetre, while global climate models typically operate with a grid size of 50-100 km. Low and a few high clouds over Barents Sea, September 14, 2004. The formation of clouds always occurs on a much smaller scale than can be represented by grid size used by global climate models. In addition, clouds often occur in several layers above each other, adding to the difficulty of modelling the global cloud cover correctly. Variations in solar irradiance are recognized as a fundamental forcing factor in the climate system and may directly or indirectly influence the amount of clouds. For instance it is generally believed that the main cause of the cold intervals during the Little Ice Age 1300-1900 was reduced solar irradiance (Lean and Rind 1998; Shindell et al. 2001). The solar irradiance varies by about 0.1 percent over the approximate 11-year solar cycle, which would appear to be too small to have an impact on climate. Nevertheless, many observations suggest the presence of 11-year signals in various meteorological time series, e.g., sea surface temperature (White et al. 1997) and cloudiness over North America (Udelhofen and Cess 2001). The flux of galactic cosmic rays (GCR) varies inversely with the solar cycle. Svensmark and Friis-Christensen (1997) suggested that GCR enhance low cloud formation, explaining variations on the order of 3 percent global total cloud cover over a solar cycle. A 3 percent cloud cover change corresponds to a radiative net change of about 0.5 W/m2 (see above), which may be compared with the IPCC 2007 estimate of 1.6 W/m2 for the total effect of all recognized climatic drivers 1750-2006, including release of greenhouse gasses from the burning of fossil fuels. Since clouds have a net cooling effect on climate, the above would imply (Svensmark 1998) that the estimated reduction of cosmic ray flux during the 20th century (Marsh and Svensmark 2000) might have been responsible for a significant part of the observed warming. Since 1983, the cooling cover of low clouds have decreased from 29% to about 25% (see below). During the same period the net change of warming high clouds have been small (see below). The new hypothesis on cloud formation being influenced by the intensity of galactic cosmic rays has been exposed to critique (Kristjánsson et al. 2002; Kristjánsson et al. 2004). Later, however, new experiments demonstrated that cosmic rays may indeed produce cloud condensation nuclei (CCN's). By way of the SKY experiment in Copenhagen was demonstrated how electrons set free in the air by passing cosmic rays help to assemble building blocks for CCN's (Svensmark et al. 2006, Svensmark 2007). As more experiments are carried out and longer and improved dataseries on cloud cover, cosmic rays, atmospheric water vapour, the amount of atmospheric aerosols, etc. are established, knowledge on cloud cover formation will improve. Until all processes controlling cloud formation are thoroughly understood, any attempt of modelling future climate change may well prove in vain. Diagram showing monthly variations in total global cloud cover since July 1983. During the period of observations, the total amount of clouds has varied from about 69 percent in 1987 to about 64 percent in 2000. The annual variation of the cloud cover follows the annual variation in atmospheric water vapour content, presumably reflecting the asymmetrical distribution of land and ocean on planet Earth. The time labels indicate day/month/year. The variation of different types of clouds can be seen in the diagram below. Data source: The International Satellite Cloud Climatology Project (ISCCP). The ISCCP datasets are obtained from passive measurements of IR radiation reflected and emitted by the clouds. Last data: December 2009. Last figure update: 4 September 2011. Within the still short period of satellite cloud cover observations, the total global cloud cover reached a maximum of about 69 percent in 1987 and a minimum of about 64 percent in 2000 (see diagram above), a decrease of about 5 percent. This decrease roughly corresponds to a radiative net change of about 0.9 W/m2 within a period of only 13 years, which may be compared with the total net change from 1750 to 2006 of 1.6 W/m2 of all climatic drivers as estimated in the IPCC 2007 report, including release of greenhouse gasses from the burning of fossil fuels. These observations leave little doubt that cloud cover variations may have a profound effect on global climate and meteorology on almost any time scale considered. Since July 1983, ongoing variations in the global cloud cover have been monitored by The International Sattelite Cloud Climatology Project (ISCCP). This project was established as part of the World Climate Research Program (WCRP) to collect weather satellite radiance measurements and to analyse them to infer the global distribution of clouds, their properties, and their diurnal, seasonal and interannual variations. The resulting datasets and analysis products are being used to improve understanding and modelling of the role of clouds in climate, with the primary focus being the elucidation of the effects of clouds on the global radiation balance. Data sets and graphs derived from the ISCCP project can be accessed by clicking here and making use of links displayed therein. Data and graphs illustrating observed variations since 1982 of the amount of high- middle and low level clouds can be accessed by clicking here. Diagram showing monthly variations in global cloud cover for high, middle and low clouds since July 1983. The uppermost panel shows the variation of the total amount of water vapour in the atmosphere. During the period of observations, the amount of low clouds (net cooling effect on global temperature) has been decreasing from about 29 percent in 1986 to about 25 percent in 2007. A secondary low and peak were recorded in 1990 and 1994, respectively. The amount of middle clouds (no clear net effect on global temperature) has been slowly increasing from about 20 percent in 1984 to about 22 percent in 2007. The amount of high clouds (net warming effect on global temperature) decreased slightly until around 1999, and has since then again increased somewhat. The time labels indicate day/month/year. Data source: The International Satellite Cloud Climatology Project (ISCCP). The ISCCP datasets are obtained from passive measurements of IR radiation reflected and emitted by the clouds. Please note that the step-like change in atmospheric water content 1998-1999 may be related to changes in the analysis procedure used for producing the data set, according to information from ISCCP. The cloud cover data, however, should not be affected by this. Last data: December 2009. Last figure update: 4 September 2011. Scatter diagram showing the global monthly low cloud cover plotted versus the monthly global surface air temperature, since July 1983. High values of low cloud cover are associated with low global temperatures, demonstrating the cooling effect of low clouds. A simple linear fit model suggests that an increase in global low cloud cover of 1 percent corresponds to a global temperature decrease of about 0.06oC. From a simple statistical point of view, this model explains about 31 percent of observed spread of surface air temperature in the diagram. The cooling effect of low clouds is almost similar to the effect of all types of clouds shown higher up this page. The global surface air temperature was calculated by adding 15oC to HadCRUT3 temperature anomaly data. Nobody knows the real surface air temperature of planet Earth, but this presumably represents a useful approximation. The statistical association between cloud cover and global temperature shown does not depend upon this calculation. The global cloud data are of course dominated by the huge surface areas near the Equator, and on a smaller scale the regional and local effect could well deviate from the average global cooling effect displayed by this diagram. Data sources: The International Satellite Cloud Climatology Project and University of East Anglia's Climatic Research Unit. Last cloud data used: December 2009. Last figure update: 4 September 2011. As mentioned above, it has been suggested that the special conditions during the period following the 1991 Mount Pinatubo eruption might affect the association between monthly low cloud cover and global temperature shown in the diagram above. However, removing the data from the period with low temperatures after the eruption (199107-199212) only has a very small effect on the statistics as can be seen from the text in the diagram. So the conclusion remains that an global increase in low cloud cover of 1 percent empirically is associated with a decrease in global surface air temperature of about 0.07oC. Click here to see a similar analysis for the total global cloud cover. Tropical (15oN-15oS) total cloud cover (green) according to the International Satellite Cloud Climatology Project (ISCCP), and global monthly average surface air temperature (blue) according to Hadley CRUT, a cooperative effort between the Hadley Centre for Climate Prediction and Research and the University of East Anglia's Climatic Research Unit (CRU), UK. The ISCCP datasets are obtained from passive measurements of IR radiation reflected and emitted by the clouds. The diagram begins at July 1983, the starting date for the ISCCP cloud data series. Base period for the HadCRUT3 is 1961-1990. Last month shown for HadCRUT3 data: July 2011. Last month shown for ISCCP data: December 2009. Latest diagram update: 4 September 2011. As has been argued elsewhere on this web site, the amount of direct solar radiation received in the Equatorial regions presumably is important for both the global sea surface temperature and the global air temperature. In this context, the amount of tropical clouds is likely to represent an important control on the amount of direct solar radiation reaching the planet surface near Equator, from where the heat might be at least partly redistributed to more extensive parts of the planet surface by ocean currents and advecting air masses. The diagram above lends empirical support to this inference. The period until around year 2000 was characterised by generally increasing global air temperature and decreasing tropical total cloud cover. Following 2000, the stable or even slightly decreasing global surface air temperatures associates with a small increase in total tropical cloud cover. In the diagram below, the amount of high level and low level tropical cloud cover is shown for additional information. The amount of middle level clouds has essentially been stable since 1983; about 15-16 per cent, and is not shown in this diagram. Tropical (15oN-15oS) high (red) and low (purple) cloud cover according to the International Satellite Cloud Climatology Project (ISCCP), and global monthly average surface air temperature (blue) according to Hadley CRUT, a cooperative effort between the Hadley Centre for Climate Prediction and Research and the University of East Anglia's Climatic Research Unit (CRU), UK. The ISCCP datasets are obtained from passive measurements of IR radiation reflected and emitted by the clouds. The two thick lines show the running 13 month average. The diagram begins at July 1983, the starting date for the ISCCP cloud data series. Base period for the HadCRUT3 is 1961-1990. Last month shown for HadCRUT3 data: July 2011. Last month shown for ISCCP data: December 2009. Latest diagram update: 4 September 2011. The influence of surface evaporation, cloud formation and precipitation on the total planetary greenhouse effect and albedo leaves little doubt of the importance of these factors for understanding climate change. An improved understanding of these phenomena is of paramount importance for understanding global climate change. Click here to open a detailed graph showing change of low clouds since 1983. Click here to open a detailed graph showing change of high clouds since 1983.